You've entered my site through a webring! I am delighted you have come to look at my prints. 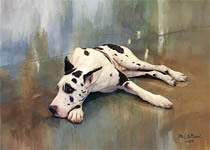 Please go to my main page, (www.kmdogart.com) to see if I've painted your breed yet. Paintings in progress: Borzoi, Scottish Deerhound, Kerry Blue Terrier, another Golden, and another Westie. WHAT breed would you like me to do next? Paintings by Karen McClelland © 2001 - 2005, All rights reserved. No part of the work shall be used, reproduced, stored in a retrieval system, or transmitted in any form or by any means electronic, mechanical, photocopying, recording or otherwise used. These images have been digitally watermarked.